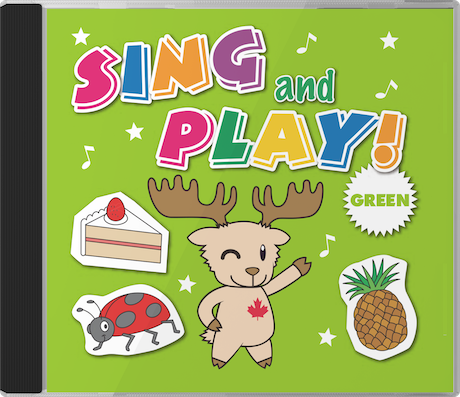 Sing and Play Green features fun and easy to learn songs for preschool, kindergarten, and the ESL classroom. Works best with children 3 to 5 years old. If you are looking for something new and fresh to use in your classes, this is it! Teachers and kids love our unique and original songs like Let’s Make a Pizza — children make a pizza with cut-outs as they sing and play along! *Click on song titles to view teacher’s videos, lyrics, resources, and more for each individual song. Fun hello song with lots of actions. ABC Song with time to play and dance. Open and shut body parts. Practice colors and review vocabulary. 18. Can You Play The Drums? Body parts / prepositions / actions. Clean up song / transition song. Good bye song with lots of fun actions. Review more colors and vocabulary. Play the drums on different body parts.